When I look back on the path I have followed, I must acknowledge that my mother had a strong influence on the directions (Mom GPS). A road less discouraged. She told me a story about my propensity to entertain at an early age, it seems she was feeling rather ill one day and decided to rest. She apparently advised me to remain clear of her resting area in case what she had was contagious such as the flu or some other nasty airborne virus. According to her story, I obeyed by sitting the hallway next to the bedroom which was ideal. I stayed clear, but apparently I didn't stay quiet. I decided to entertain her by spinning yarns and tales off the top of head, which according to her, lasted for an hour straight. Now at any point she could have told me to be quiet or please shut up or any other number of silencing techniques but she didn't. She let me ramble. And from that day forward, that has been pretty much the case. That is not to say, there weren't times she would tell me to turn it down a few clicks, but still, the fact that she more or less allowed me to explore my imagination and let it take voice. I am forever grateful. My mother has always been my most captive audience and critic. In my High School years, she didn't wince when I told her I was interested in the performing arts, in fact she encouraged me. At the same time I witnessed other parents of my peers pooh pooh the same dream: "You want to act? Write? Paint? Be a Musician?! What are you, out of your mind? Have you fell on your head? Learn a trade for crying out loud! Put away childish things!" My mother also encouraged me to read books at a very early age, I think it was a way to keep me quiet for a few hours as well as allow her to escape for a time. 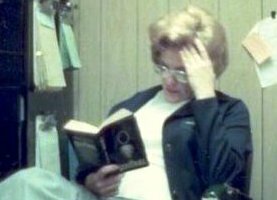 I always recall a paperback in her hand, wherever we went so out of curiosity and of course encouragement, I was introduced to the Hardy Boys crime novels. The Hardy lads were way more interesting than the See Sally Run, Run Sally Run garbage I had at school. When I began writing my own stories and later plays, I could always go to my mom and discuss a plot point or solicit ideas from her. "Hey Mom, I'm stuck at this spot. I'm not sure where to go from here." She would look it over and point out the most obvious path. "What if the character in the second act implicated himself. Or what if all the characters had the same occupation?" Mom's advice could always move the blocks out of the way. To this day, my mother's advice and encouragement still leads me forward, down this same path. Never discouraged one step of the way. I can't thank her enough but I will try just a little this mother's day. She lives in a different state now, so I can't swing by on days she doesn't feel well and entertain her with stories. She finally gets to rest in absolute entertainment free quiet. But I'm sure she peeks out in the hallway every once in awhile.